The stack of speaker sign-up sheets for the F-35 ballot item towered at a packed City Hall last Monday night. People from around the state and members of the press crowded the first floor and balcony. People in polished brass mingled with those in salt-stained boots. 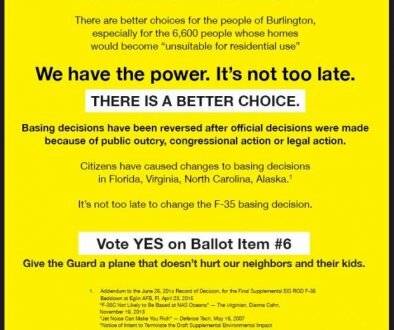 The session had skipped right to public comment; by my tally, 35 people spoke in support of the issue being placed on the ballot, and five spoke in favor of the F-35’s and against the ballot initiative that would advise for an alternative to these aircrafts. The winter chill could not freeze the petitioners nor democracy in the weeks leading up to this meeting — over 2,700 signatures, about 1,000 more than the 1,787 required to put the F-35 advisory question on the Town Meeting Day ballot — have made their way to the city clerk. City Hall filled with murmurs as supporters of the F-35 debate said, “Why are we still arguing this?” I tried to gauge the council and Mayor Miro Weinberger’s reactions as my fellow Vermonters spoke. Despite the Air Force’s 2016 declaration that “… if there is no F-35A operational bed-down at Burlington Air Guard Station, the current mission would continue,” Vice Wing Commander Harder asserted that there would be no alternative mission for them if the F-35’s were stopped. Ray Gonda, a Vietnam veteran who lives near the airport, stated, “Burlington gets the goodies, while I and my neighbors pay the costs … Burlington has profited handsomely [from this project] by acquiring, free of charge, many formerly private-owned properties near the airport in my community.” People spoke about livelihoods, democracy, racism, birds, noise pollution and justice. The council asked the audience to settle down on numerous occasions — but applause, like the noise of jet engines, could not be mitigated. VT National Guard press conference Jet Noise Can Make You Rich!